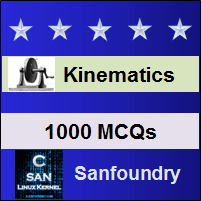 Practice Machine Kinematics questions and answers for interviews, campus placements, online tests, aptitude tests, quizzes and competitive exams. This set of Machine Kinematics Multiple Choice Questions & Answers (MCQs) focuses on “Belt, Rope and Chain Drives”. Explanation: It is the ratio between the velocities of the driver and the follower or driven. N2 = Speed of the follower in r.p.m. ∴ Velocity ratio, N2/N1 = d1/d2. Explanation: In a cross belt drive, both the pulleys rotate in opposite directions. If sum of the radii of the two pulleys be constant, then length of the belt required will also remain constant, provided the distance between centres of the pulleys remain unchanged. Explanation: The result of the belt slipping is to reduce the velocity ratio of the system. As the slipping of the belt is a common phenomenon, thus the belt should never be used where a definite velocity ratio is of importance. Explanation: When the power transmitted is maximum, 1/3rd of the maximum tension is absorbed as centrifugal tension. where TC = Centrifugal tension. where m = Mass of the belt in kg per metre length. Explanation: When the driver starts rotating, it pulls the belt from one side (increasing tension in the belt on this side) and delivers it to the other side (decreasing the tension in the belt on that side). The increased tension in one side of the belt is called tension in tight side and the decreased tension in the other side of the belt is called tension in the slack side. Explanation: It is given by p = d sin (1800/T). Sanfoundry Global Education & Learning Series – Machine Kinematics. To practice all areas of Machine Kinematics, here is complete set of 1000+ Multiple Choice Questions and Answers.